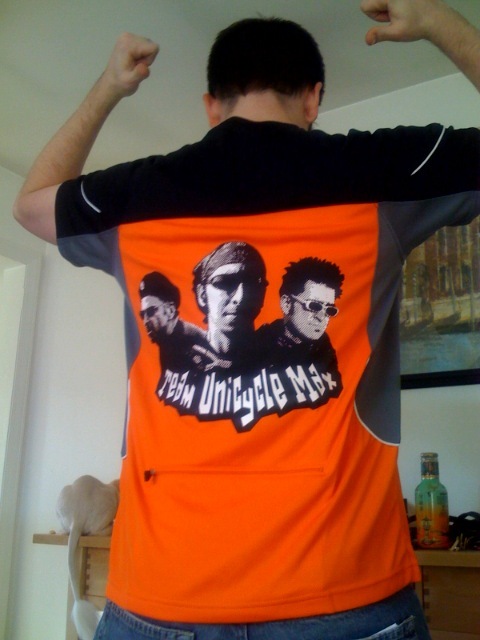 As Max mentioned earlier, the official Team Unicycle Max jerseys and t-shirts are in. Great Graphics in north Philly hooked us up with an excellent screenprinting job. So now no matter how we finish in the race, at least we’ll be do it in style. The numbers continue to tick away on the countdown to Ride the Lobster, but this isn’t the only game in town. The beginning of summer marks the beginning of the summer bike race season. The 2008 Commerce Bank Triple Crown of Cycling starts today in Allentown, PA which is always a big event arount here. Philadelphia is a pretty cycling-friendly city, better than average anyway. Still, drunken idiots are everywhere, and the tragedy that happened in Mexico over the weekend could unfortunately happen anywhere. Be safe out there kids. Keep your head up and watch out for idiots. This is a terrible tragedy, but I hope some good comes out of it and the rest of the summer cycling season is safe and fun. I don’t have television, so I’m listening to the hockey game on internet radio out of Detroit. The Red Wings can take the Stanley Cup tonight if they beat the Penguins. Now, even though Team Unicycle Max is spread out geographically, we are one and all Red Wings fans. The game just finished up it’s first sudden-death overtime period, and I’m trying not to fidget by writing. I got word from Carrot Signs that our Team Unicycle Max flag is on its way, and should arrive by Saturday. 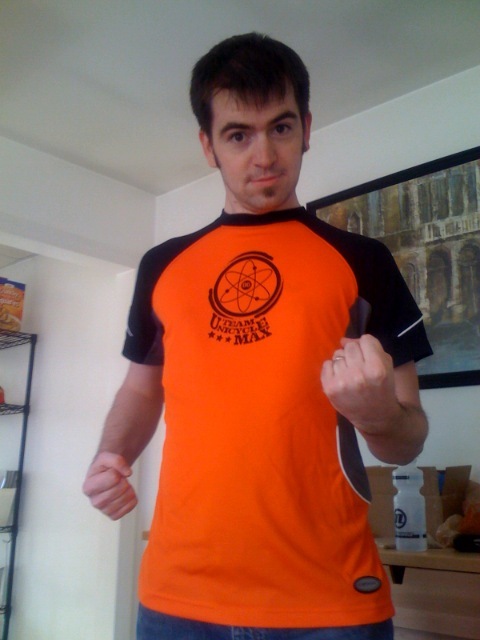 Kyle sent me pictures of the jerseys and T-shirts, back from the printer, and they’re fantastic. Now that our bodies are in shape, and our unicycles are in top notch condition (okay, so mine was the only one that needed a real tune up, but my Captain Pasquale has never been better), we’re getting our merch together. It’s pretty cool. We should get some stickers made up. We won’t have them for the race, but they’re pretty cheap to have made up. I’ve officially started teaching Courtney to unicycle. I don’t know if I’ve gotten to be a better teacher, or if she’s just a good student, or what, but she’s picking it up quickly. It typically takes between 8 and 12 hours of practice before you can be called a unicycle rider, defined by being able to ride 50 meters unassisted. Courtney has three hours in the saddle right now, and she’s been able to unicycle three or four meters. She’s not free mounting yet, but once she gets a little more comfortable riding, I’ll have her start. She’s really doing well, I’m proud of her. The second overtime period just started, and Marc-Andre Fleury, goalie for the Penguins, has 49 saves so far. forty Nine! This is getting ridiculous. This game started on Tuesday. I made a list of all the things I need to bring up to Nova Scotia. It’s a surprisingly short list, as we’ll be spending most of our days on the roll. That’s how close we are to the race. I’m starting to do laundry, and get ready to pack.